I've had two full on winter powder days this week, and yesterday some of the best lines of the season. Driving up to the Lautaret was a gamble with low cloud in the valley and only the occasional glimpse of sunshine with flat light so it was all about stealth skiing, that is waiting for the break in the cloud so you're skiing back down in good and not flat light. 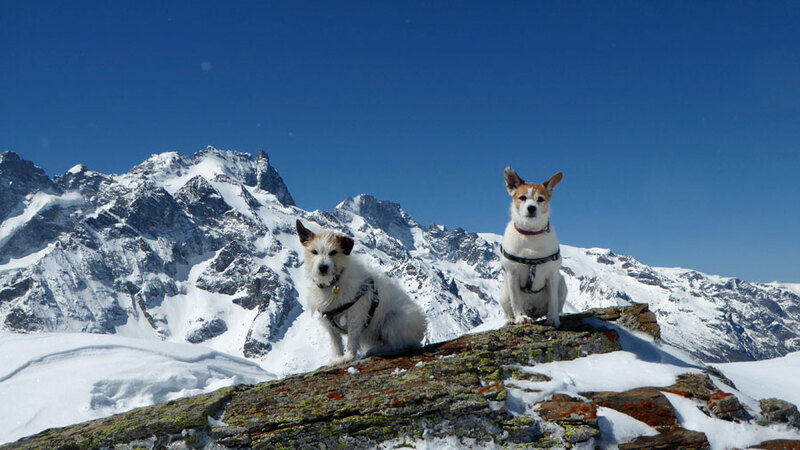 As I did not have Les Rando Chiens with me (snow too deep) I had other route options, as they are not allowed into the National Park which is on the other side of the road from the Lautaret. 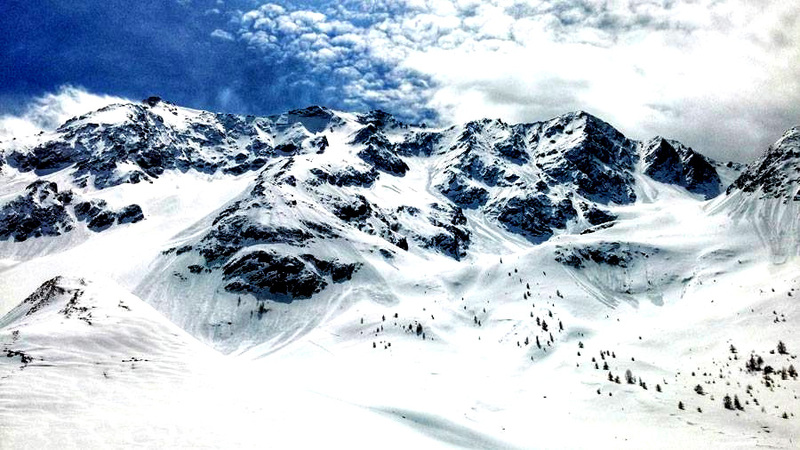 There is something about this area known as the Vallons de Combeynot with it's very grand North facing bowl and couloirs. Monday was good, though I only climbed to the ridge (420m) as I'd already done a prior ascent to the Galibier road but I was none too happy with the conditions up there and vis was bad. Then yesterday after yet more overnight snow as I climbed up more cloud rolled in and light was so flat that at times it was difficult to see the skinning track. I told myself that after I'd done 650m then if light was looking good take the descent rather than climb further. So at around 2720m it looked as if there was a good chance of a clear spell and I quickly went into descent mode. And, yep, more snow today. See webcam. 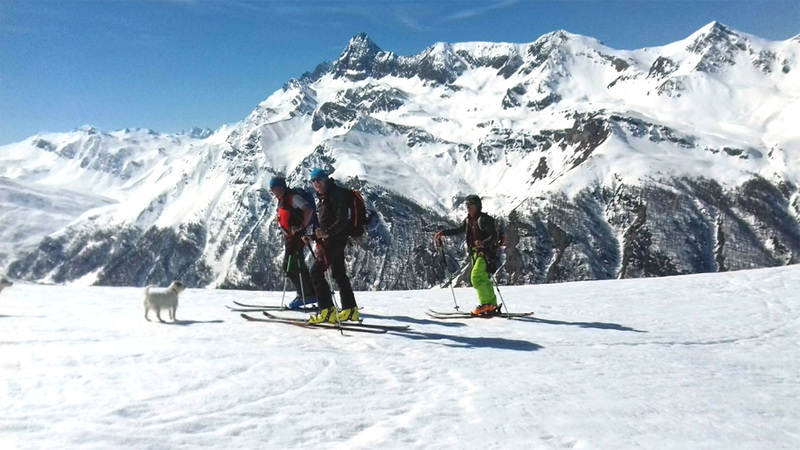 When we parked up just below the Lautaret on Saturday there was a handful of cars with two groups of Italians and French who all headed towards Les Trois-Évêchés about 10 minutes before we set off with the Rando Chiens. Well, this was like showing the hare to the greyhound for Gavin. Taking a different touring route we caught them up on the Galibier road, then took a higher line keeping in front of both groups as they traversed up the left hand narrower valley. As we headed on the ridge below Montagne de Chaillol we turned around to see both groups totalling around 20 following our tracks. It felt like Butch Cassidy and the Sundance Kid being hounded by the sheriff's posse. Where we stopped below the ridge to put on layers as an icy wind was howling from La Grave making the dogs shiver and ears stand up, they paused right beside putting jackets on, too. Gav decided he could not go further because a handful had peeled off to cut below us and it would have been darn dangerous for anyone to traverse above on the steep slope and possibly cause an avalanche on top of them. The majority took their skins off exactly where we were.. This is like laying your towels down on a completely empty beach only to have 'foreigners' arrive and put theirs within a foot of yours with all that untouched sand to choose from. 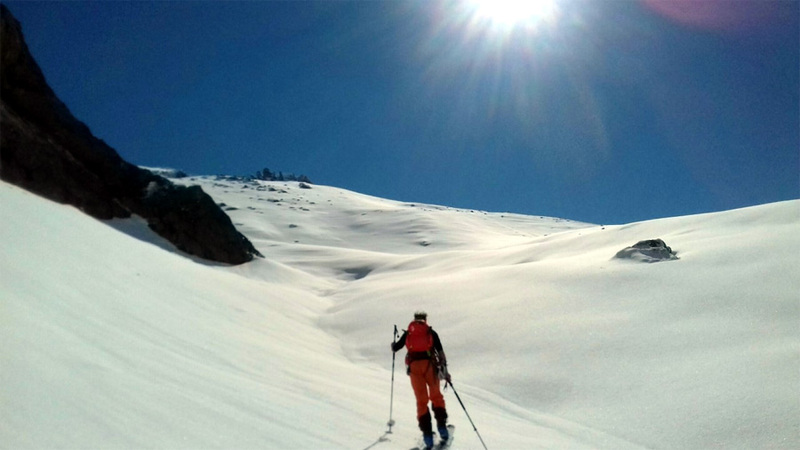 The glorious thing about ski touring is getting away from people, being able to take your own line. Les Trois-Évêchés area is massive with a huge choice of routes to take up (see below) and ways down without sometimes even seeing another person (see our route up below). It's an unspoken etiquette that you give tourers their own space otherwise you might as well be in a chairlift queue. Of course, the hare was still running for Gav as we set off down only just ahead of the French and Italian tourers. Unfortunately our skis had completely iced up so they wouldn't move even facing 45 degrees downhill on powder - something that only happened to me once before on my snowboard in the Lyngen Alps. Then I had a lovely guide, Per, to help de-ice. This time I had a fuming husband! In fact the snow varied from powder to sludge on the way down. And, yep, we beat the groups but not before Gav had sworn loudly a couple of times at them as diplomatic as Boris at a EU foreign affairs council. Aw what's wronga you Brits? Why you no wanna join our group so we all ski together? Huh? There's a gloomy canopy of grey cloud, today, although there's a snow line at around 2000m but we'll need a day or two of freeze/thaw before contemplating any more spring touring. This morning we woke up to a white out (image below). It was tempting to get excited and head for the hill except, of course, as there are no lifts it would mean touring up in very little vis. So we waited until it stopped snowing at around 11am, did some shopping and then drove to the Col du Lautaret just to see how much had fallen up higher. As we stood throwing wet lumpy snowballs down the hill for the Jacks who ploughed gamely up in the heavy snow that was around their head height (25cms) we could hear the ominous runbling of snow sliding from some great heights. When the cloud cleared we could see that the fresh snow had slithered from nearly every available warm rock surface (see second image). There's more snow due here, tomorrow, then some inevitable wind. 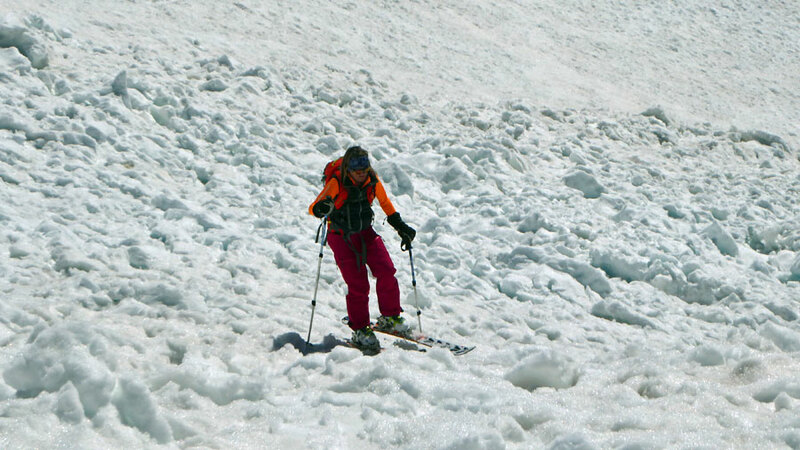 Fingers crossed this will be follwed by freeze/thaw and good ski touring for our final days of the season! Watch this space. 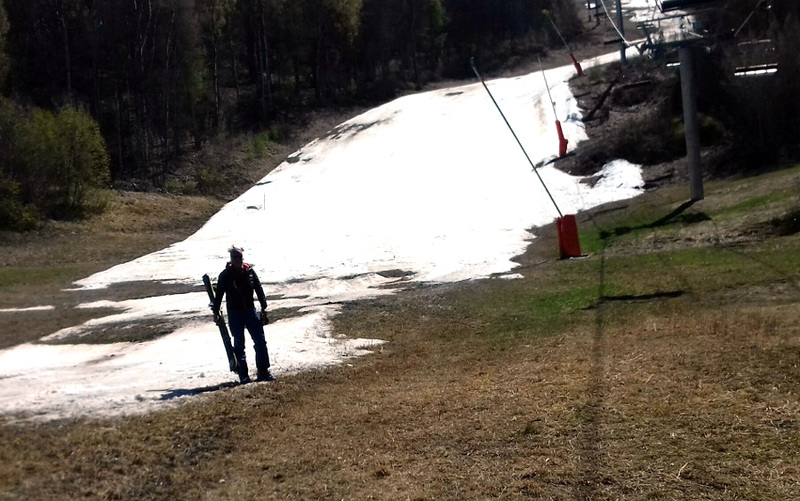 The restaurants stacked their chairs, the lifts came to a stop and the snow receded another metre up the slopes on the last day of the season here in Serre Che. We skied with friends down empty pistes, had a beer in the sun and just made it down to resort level, dodging grass patches on the Casse du Boeuf run and walking the last 100m over the meadow. 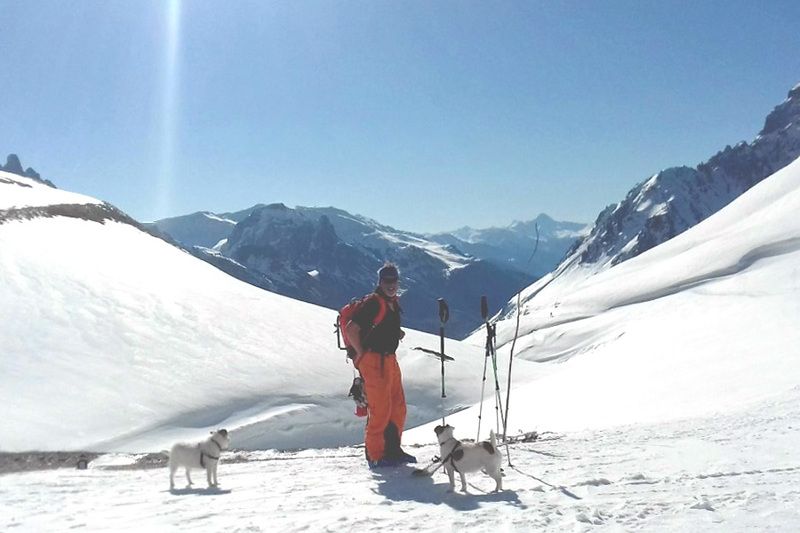 The cold temperatures and chill breeze over the past few days has meant no spring snow for touring, though it doesn't stop some die-hard tourers who go anyway and ski the hard park whatever. But if you're going to 'earn your turns' walking up we'd prefer to earn good snow. So as soon as the thermometer started to rise again we were back to what is now our favourite valley up from Cervieres, ready to boot pack up the first half mile or so to the ever receding snow line and taking crampons for the early icy climb. 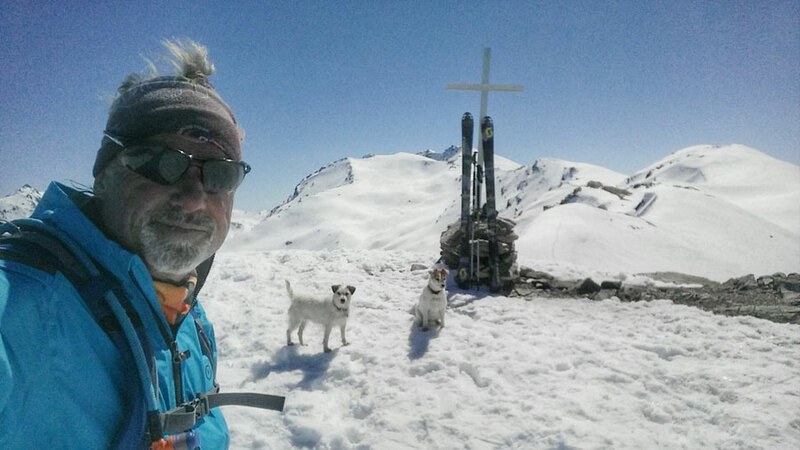 We made it to the border pillar at 2650m in good time, too good as the snow was still pretty hard. So we skied down the south side but ran out of snow after around 150m but it killed another 30mins with the skin back up. After some patie en croute shared with the Rando Chiens and a few photos, it was around 12.30pm when we eventually headed down. The snow wasn't perfect but it was't bad either. 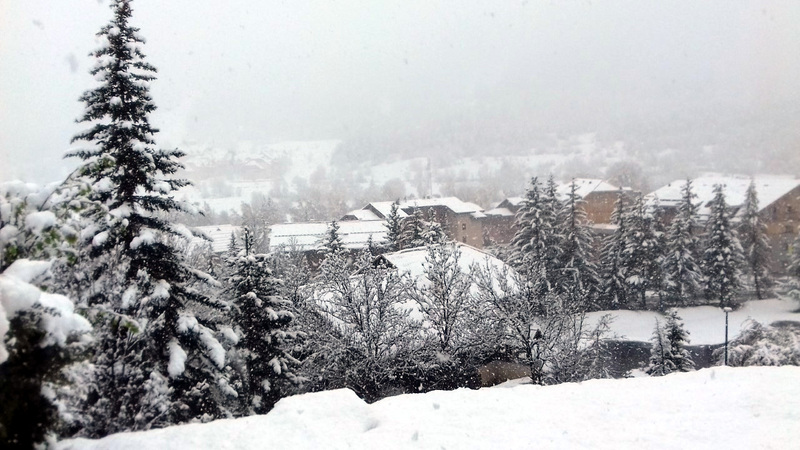 There's a definite end of season vibe here in Serre Che although the resort doesn't officially close until next Saturday. 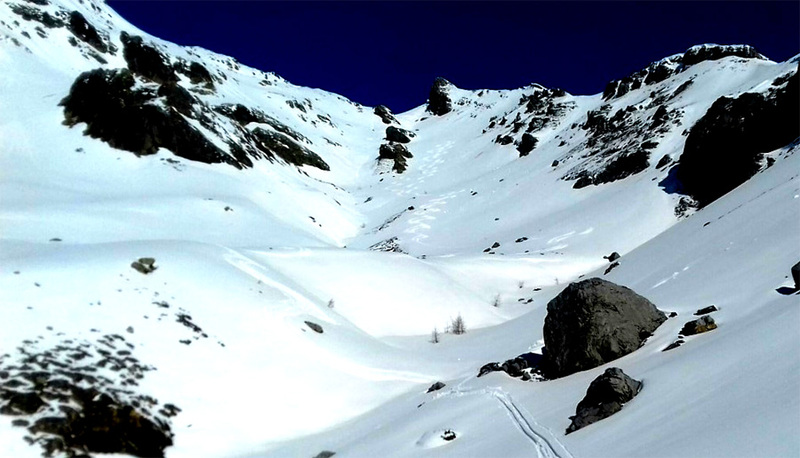 Unfortunately the Mea drag was also closed so we had to skin up from the top of the Clot drag to the col and then go over and around the back of Roche Gauthier towards Cucumelle for a short 200m vertical hike before taking the skins off. And Gav was right. It was around 2pm and the snow had transformed perfectly though it's pretty steep going down so we had avy bag triggers at the ready. Apart from a rock or two there was pristine spring for turn after turn for 400m until we ran out of snow. 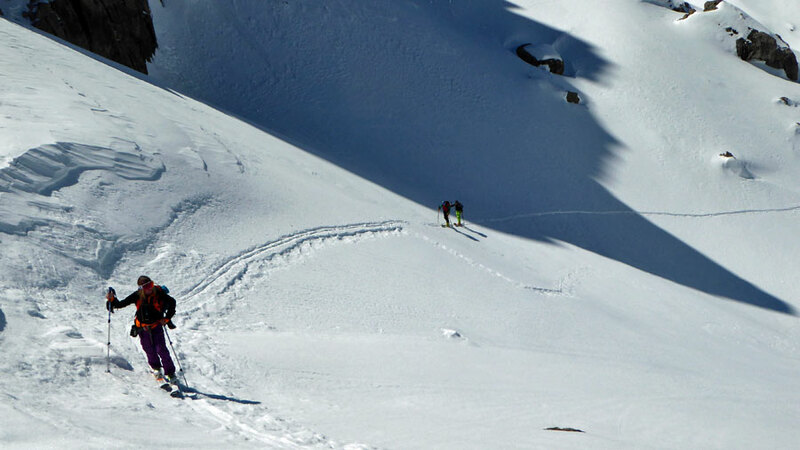 We earned these turns by having to skin up to the ridge above the Cucumelle chair over some rather precarious avalanche debris and then a leg achingly sticky ski down the Cucumelle. 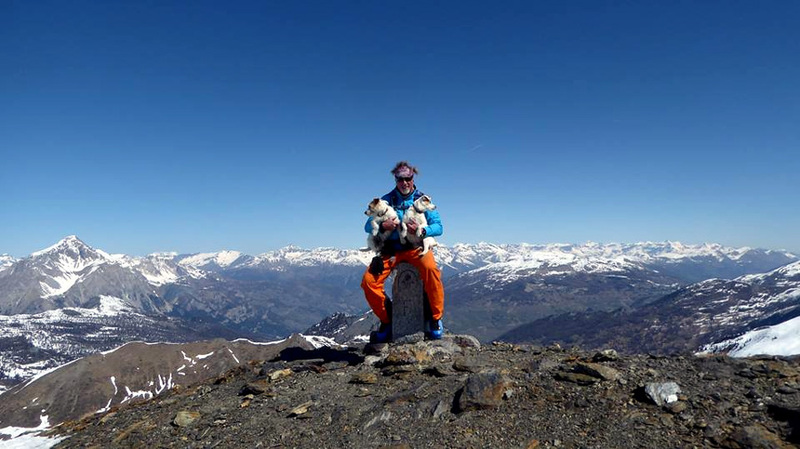 We decided to go back to our new found valley, but this time climb further and higher along the ridge to the Cima Dormillouse peak topping out at 2908m. Since we were last there three days ago the snow had receded even more, the good news was that we could now drive further along the valley floor but the payback was that we had to climb further until we were able to put the skis on, not that the Rando Chiens complained as there seemed to be more marmots around! 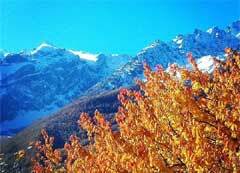 It was a long climb and traverse and difficult to know which was the actual summit as there were a series of peaks. In the end the 'Cross' gave it away! And climbing up from the valley below the views were stunning. 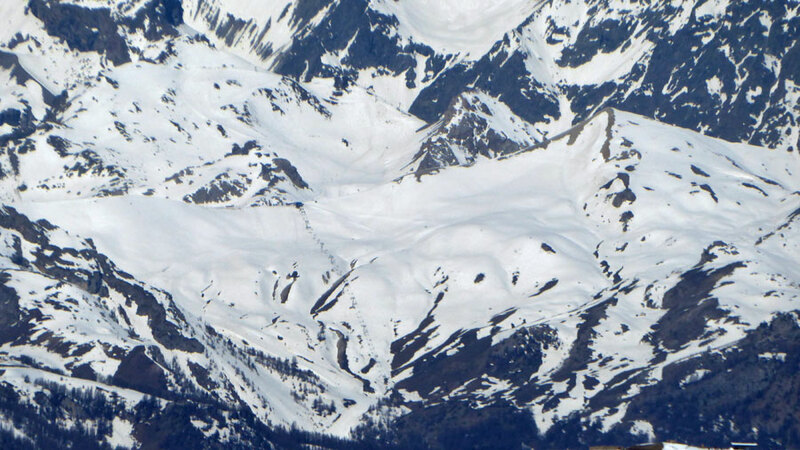 And now from the same place zoomed in to Serre Chevalier and the Vallons chairlift and Cucumelle! There are still more options to do from this valley though they entail longer approach walks, though we're hoping the valley road will open further next week, but think the name of the game is to pack some approach shoes. 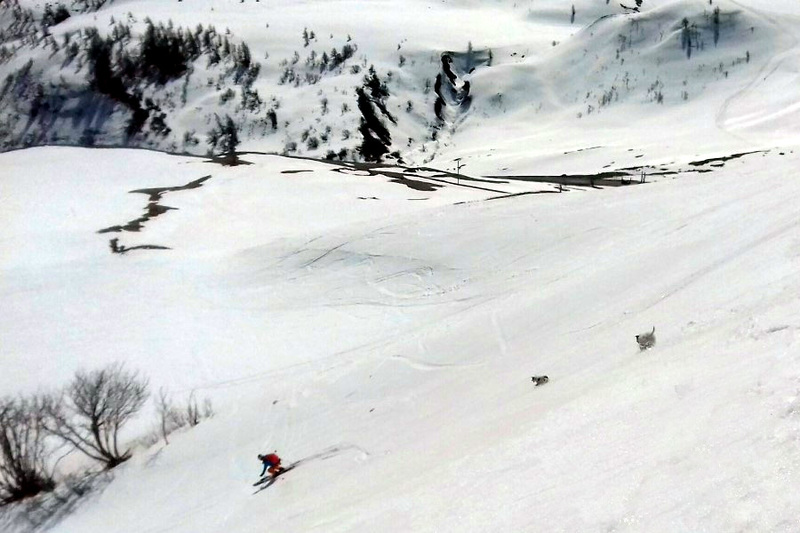 Knowing that the Monetier lifts would soon be closing (Easter Monday), I decided to do what will probably be the last off the back of Yret of the season down Ravine Montagnolle. 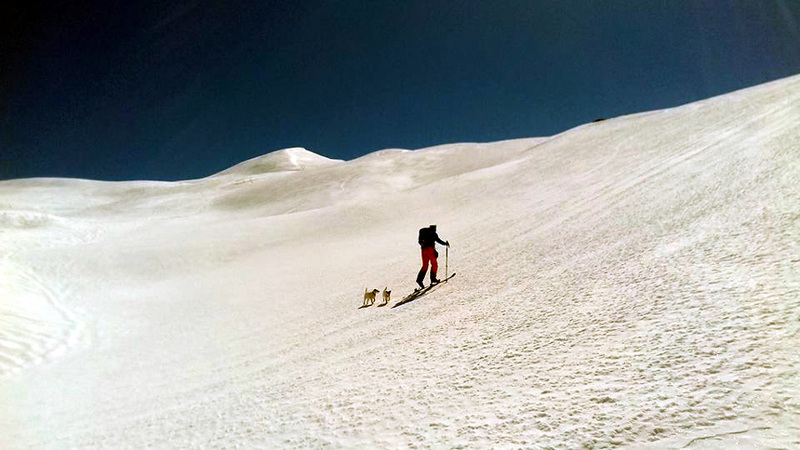 On the way down I came across four guys boot packing up who were trying to ski the traverse but had run out of snow. They smiled as they saw me thinking that I had made the same mistake but I explained to them that I was going all the way down, and was packing skins to climb back up and felt quite smug at that moment! However the run down was not one of the best as the snow was very patchy. On the climb back up I kept looking at another face that was more W/NW facing thatI had before - and it would probably be just about right by the time I'd climbed back up, then skied down to then take the lift to the Col de Mea. So seemed liked a plan? The run back down the Vallons was a slush fest and did have me thinking what would it be like in 90 minutes time? Could it be any worse? The first part of the plan had a spanner in the works, as only the shorter Col de Mea drag was working, so I had to take that and then mount skins and climb up the rest of the piste to the Col and then higher up behind the Roche Gauthier. Then as you can see it was a superb descent. 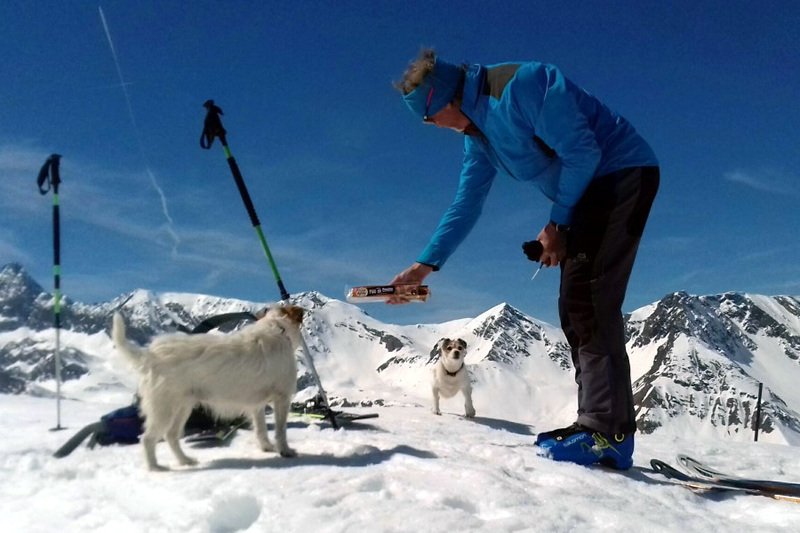 The alarm went off at 6.15am and I was still yawning when we met Ken and Kevin, yesterday, for a new ski tour up from Cervières at the foot of Col d'Izoard climbing towards Crête de Dormillouse as, thanks to Gav's planning and an earlier recce via a walk with the Jacks, it looked like there was great ski touring up there. And, as ever in April, temperatures were warming up so hence the early rise. We drove as far as we could up from Cervières towards Les Fonds before there was too much snow on the road, parking the van at La Chau. 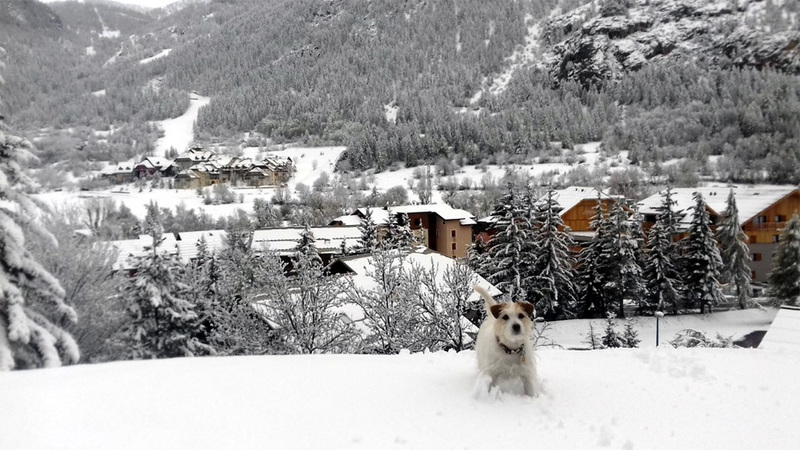 It was then a 20 minute skin along the snow covered road past the village on the hill of Le Bourget and the little chapel until the ascent started. We were soon in a ski tour equivalent of Teletubby land and a rolling white landscape with an ever higher gradient beyond each climb. It was a tad icy for the first hour so we all used crampons. We took a leisurely 3 hours 30mins up to 2650m with a couple of stops for water/snack/taking off layers. 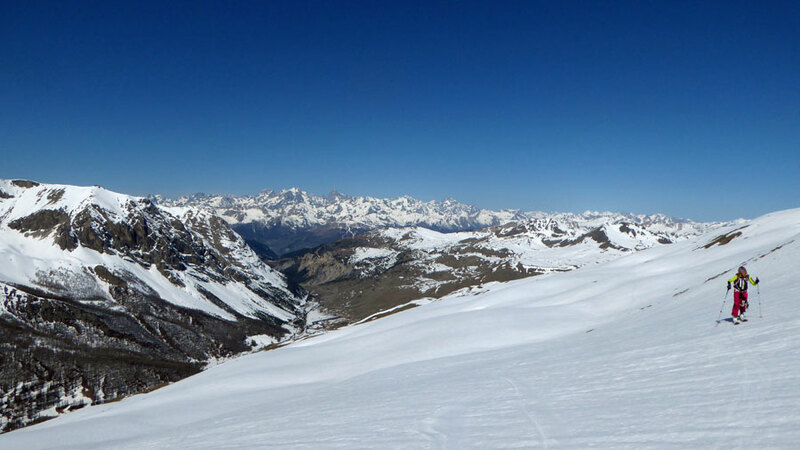 Gav went an extra 50m to scope out a potential ski down the south facing side towards Les Chalps where the snow had already turned to spring conditions which would mean skinning up again. As ever the Rando Chiens did some extra mileage chasing the whistling marmots and even a couple of deer. So they wolfed their share of Pate en Croute for lunch. But some cloud was coming over so via walkie talkies we decided to leave it for another day (probably Friday!) 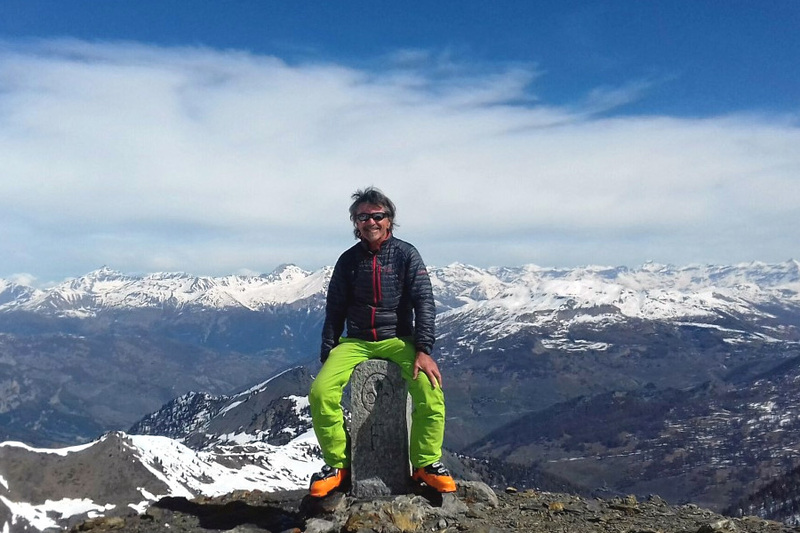 and had a 20 minute rest at the France/Italy border stone post (see Ken sitting on it below) hoping the more WNW facing somewhat icier seeming slopes of the descent would turn more spring like and wondering why we got up so early! Once committed to going down we found almost perfect spring snow, although maybe a little harder at altitude and softening up to a bit of slush at the bottom. 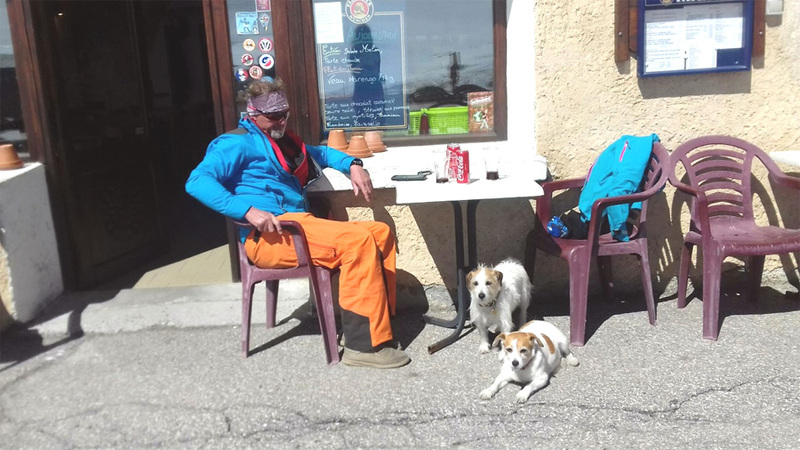 Then it was a cross country hike with heels free but no skins along the road and back to the van followed by the mandatory post-tour beer stop in Briancon. It was a just under five hours from leaving the van to coming back including plenty of stops for snacks/kit changes/photos. A very good ski tour. 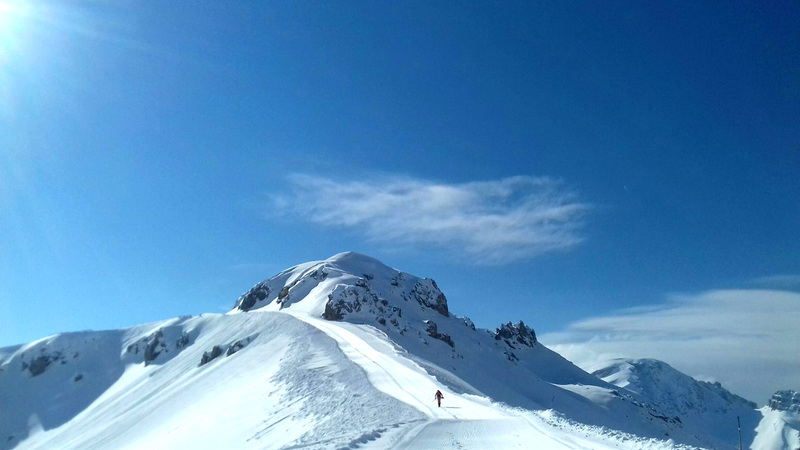 As it was the last day of lifts over the Briancon side, the plan was to ski with the Cafe Cruisers for an hour first thing and then go over Eychauda and ski down the valley, skinning back up the the Rocher Blanc chair. But the Eychauda was closed scheduled, maybe, to open at 12noon. So Plan B.. We took the Mea drag and went off the Col at the top, we being Kevin, Ken, Gav and me. So far so sweet, the snow was spring corn that is until it ran out about 300m down off the back. So skins on for a hike up of around 200m, another short ski down, hike up again to the Col de la Pisse and then it was a couple of miles down the Partias valley in rather heavy snow having to, stay high in the woods to descend to the bridge before the hike up to Rocher Blanc which was mercifully still running even though absolutely no one was skiing down as the conditions were so bad. We made it to Serre Ratier for a very welcome beer at 4pm, managed to get the last chair on the Combes and then ski down Casse du Boeuf at 5pm. Standing at 2900m in the white wilderness below the Pic des Trois Évêchés ridge where Gav was hiking to the top, the silence was absolute. Not a sound. Then there was a rumble in the distance. Then again. Somewhere rocks were crashing down the mountain. Gav and the Rando Chiens made it to 2989m before we skied back down the dazzling whiteness of the 6km we'd just toured up. It was a 1000m vertical climb and a total of 12km that took us just over 4 hours with only brief stops to take off layers. 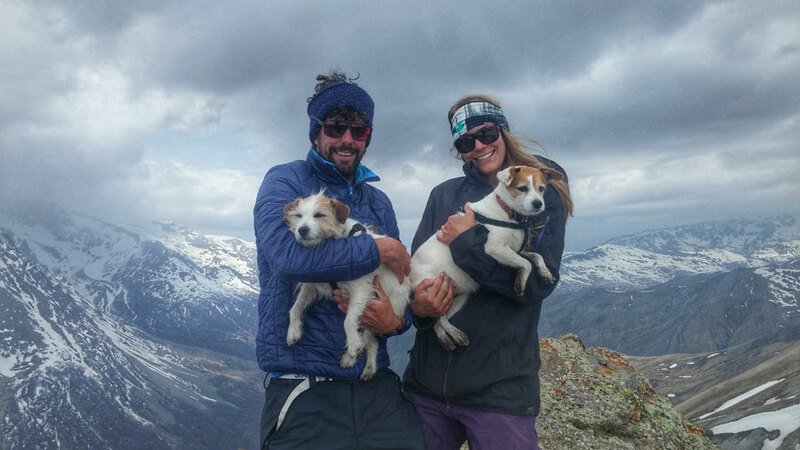 The Rando Chiens did slightly more mileage not only chasing us down but also running after the first marmot whistles of the year. So we shared a Pate en Croute with the Rando Chiens in the van followed by a welcome Coke at the Lautaret cafe. First we were going to do a longish ski tour. Then we decided the snow wouldn't have transformed enough so maybe we'd do some slackcountry (see below) off the lifts. But it was a cloudy morning so we got on with some work until, suddenly, the sun came out at around 10.30am. 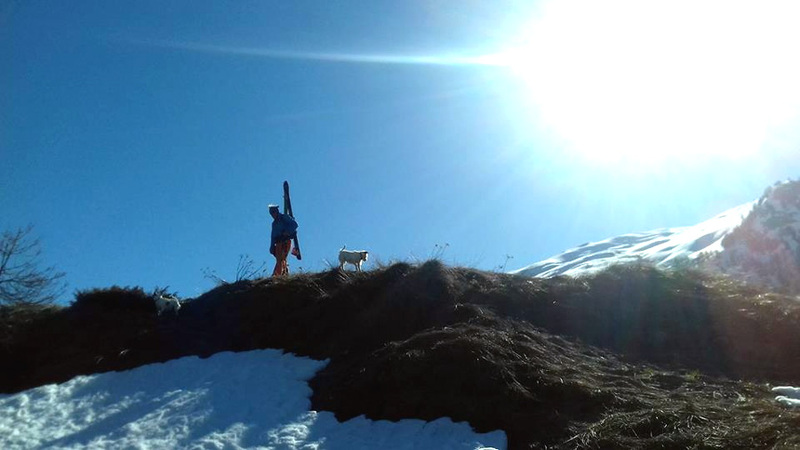 We speedily gathered avy bags and skins and headed up the hill. There was a cool breeze as we took the Eychauda drag and it didn't seem warm enough for spring snow. 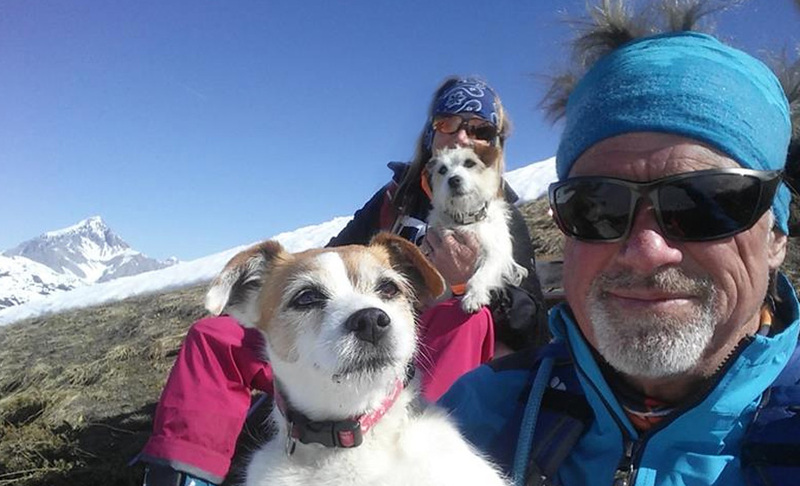 So we hangered right, skied the ridge and hiked up to the top - Pike, you know the one if you're reading this. And, yes, there was powder all the way down to the pistes - had I known when we set out I'd have gone for my fatter Nordicas rather than slightly skittish lightweight touring skis but then the plan had been for touring. Gav said 'Again?' and sped off just as the clouds came over. So that was it. Back home. And no pics. 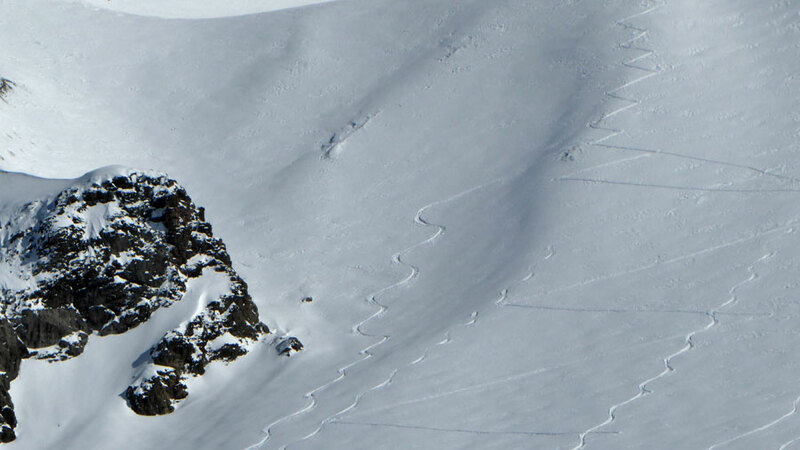 Still 20 or so sidecountry (see below) powder turns is not too shabby for April, even if it wasn't the plan for the day. Anyone confused by the meaning and the difference between 'sidecountry' and 'slackcountry'. Well, yesterday, we did both. After a pretty grey weekend with rain in the valley, there was blue sky first thing so we were on early lifts to see how much snow had fallen above 2000m while, hopefully, it was still powder before warming up in the 16C plus sunshine. First to the top of the Vallon chair where there were only a couple of tracks off the ridge to the left. Gav hiked a little higher than me and we both had good turns in the fresh powder in view of the piste - so 'sidecountry'. 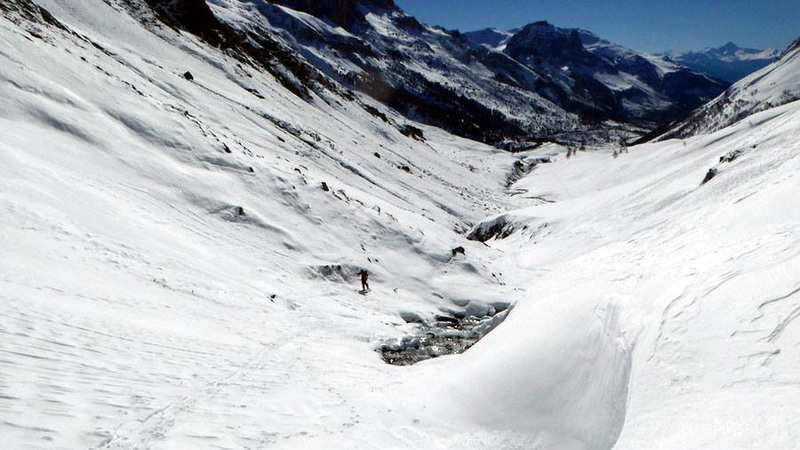 Then up Vallon again and over to Monetier to the Yretes chair where we traversed off the top and down one of our favourite secret valleys. At the top there were a couple of tracks that then disappeared though the rocks above the Cucumelle chair. But, having skins packed in our avy bags, we could ski all the way down - hence 'slackcountry' as it's accessible via lift but you need skins. As the snow was fresh and warming up ie grippy we could hike almost straight up with only a few kick turns. It only took 35mins to the top above the Cucumelle chair from the untracked S/SE side but it was quite a steep climb so sometimes I had to stop briefly after counting 50 or 100 steps (whatever works for you!). We decided to do one more ridge walk and take advantage of what was left of the 'sidecountry' powder missing out most of the chopped up slushy piste before stopping off at Le Pi Mai for a Coke. Bizarre to be doing powder then sitting in the hot sun but that's April in the mountains!